The RMS Queen Mary sailed from 1936 to 1967. The ship was part of the Cunard shipping line and served as a passenger liner between Southampton, England and New York City. The Queen Mary was used as troop carrier during World War II. The ship was removed from service when jet airlines obsoleted the need for ocean liners as the primary means of transportation between the US and Europe. 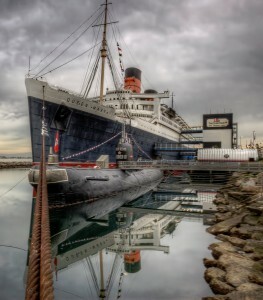 This jigsaw puzzle shows the Queen Mary as it appears today, moored in Long Beach, California. The ship is used as a tourist attraction, hotel, and museum. Parts of the Queen Mary are purported to be haunted. The ships various hauntings have been the subject of many investigations. Special tours are conducted that highlight the ship’s hauntings. The jigsaw puzzle also shows a Russian submarine moored beside the Queen Mary. The Soviet era submarine is open to the public as an exhibit. Credit: Special thanks to Neil Kremer for making the photograph used for this jigsaw puzzle available through the Creative Commons Attribution NoDerivs license. Visit Neil Kremer's Flickr photostream. See all jigsaw puzzles based on Neil Kremer's photographs.